Atlas Chiropractic, Massage and Wellness Center offers our community high quality care with a warm, family focus. 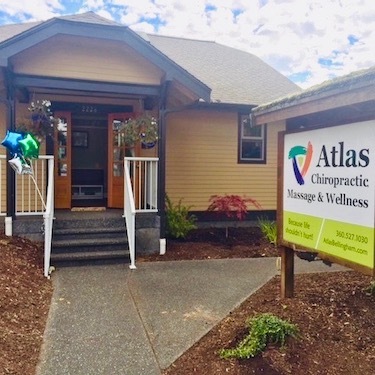 Our specialty chiropractic, massage therapy and wellness clinic serving Whatcom County is a family-based practice dedicated to bringing health and wellness to our community. Now under the caring direction of husband-and-wife team Dr. Andrew Winn and Ravin Winn, LMT, we have been serving the Whatcom Community since 1999, from our convenient location on James Street. All ages in our community are welcome to experience what we have to offer, from newborn babies to those in their 80s and 90s. We’re pleased to be of service to anyone, no matter what their particular goals may be. Read what we promise to our patients. We’re a family wellness practice and provide the highest quality of care possible. When you visit us, you’ll be treated as we would like to be treated, with care and respect. We like to say that we’re in the business of unconditional love, not judgment. No matter what outcomes you wish to achieve or what level of health you’re currently experiencing, we can help you get well. Whether you’d like to be active on the weekends, train for a marathon, overcome injury or be able to play with your children or grandchildren, we’re here for you. Contact our chiropractic care center today to have your spine and nervous system evaluated! It’s just as essential to your health as your regular checkups with your dentist. We provide a complimentary check of your insurance benefits. Contact us today!